← What Instrument Should Your Child Learn? Music has been with mankind ever since time immemorial. It relaxes our mind and even makes us feel emotions. As a parent, we only want what is ideal for our children and one thing we can invest on is their musical talent. It can help your child improve his or her academic skills. Did you know that math and music are alike? Once children understand musical terms such as rhythm, beat and scales, they can gain knowledge of division, fractions, and patterns. According to Lynn Kleiner, the founder of Music Rhapsody, music helps wire the brain of the child enabling him or her to do better in various areas in math. Once the kids grow older, they will start singing to songs, storing much to their short-term memory which will lead to the storage to their long-term memory. This skill can even be used in creating mnemonic devices in order to help aid the process of remembering. Aside from math, music is one of the most effective ways for children to understand physics. Vibrations, sounds and many more allow the child to explore scientific principles while having fun. It can build up their physical skills. If you think music is simply sitting down and plucking or beating, then you are wrong. There are specific instruments such as percussion instruments, like piano and drum, which can help develop the coordination and motor skills of your child. The drums are highly beneficial especially for kids who have unlimited supply of energy to spend. Instruments like piano and violin require a lot of actions and coordination ranging from the player’s fingers to their arms. This can even prepare them for sports and dancing. When your child is involved in music lessons where group classes are encouraged, this will help them interact with other students. It can even help them become a part of a team. They can learn how to adjust and blend themselves with the people around them. Whatever their instrument is, their goal of creating the perfect pitch and melody can make them become figuratively and literally in tune with the rest of their pals. Playing musical instrument cannot be achieved within the day. It needs constant practice and oftentimes, the gratification is delayed. Because of this, students learn the value of patience and recognize the importance of discipline. 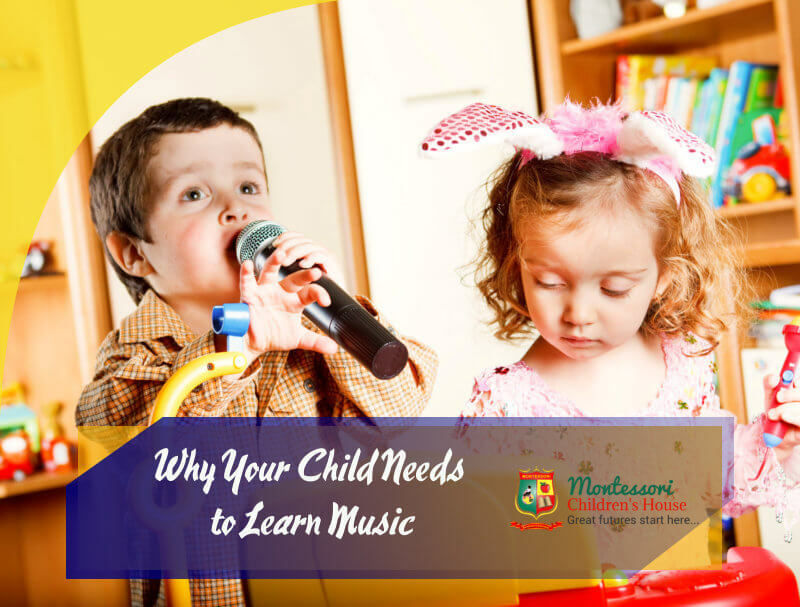 We at Montessori Children’s House find the mentioned reasons promising that is why along with our Early Childhood Education in Riverside, California, we also cater extracurricular activities such as music lessons. To inquire about our schedule and how we improve our young learner’s musical ability, visit us at www.montessorichildrenshouseofriverside.com.